A river runs through it. From Wears Valley Road turn onto Lyon Springs Road and follow that directly into Great Smoky Mountains National Park (4.4 miles). Little River Road runs between Townsend, TN and Gatlinburg, TN. The drive to Gatlinburg is 9.4 miles and approximately 4 miles to Townsend. You will have beautiful views in either direction. If you choose to drive to Townsend, you will drive alongside the river all the way where you might see kayakers, river tubing, and fly fishermen. 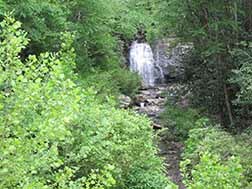 Several popular waterfalls can be seen directly from the roadside. 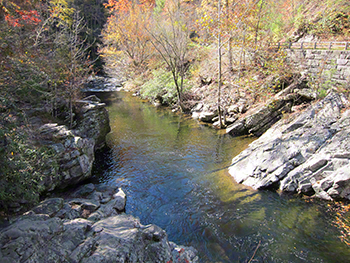 One of the most picturesque spots in the National Park is at The Sinks, just a short distance from Metcalf Bottoms. If you decide to drive to Gatlinburg, you will enjoy various waterfalls, beautiful floral and fauna, and possibly some wildlife -- maybe a bear or two and wild turkey. 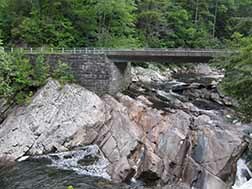 There are several hiking trails in case you want to stretch your legs. You might want to drive through Elkmont to visit the historic district. Beautiful mountain vistas will complete your trip into Gatlinburg just before you arrive at Sugarlands Visitor Center, a must see.